The Setouchi Triennale, an international art and architecture festival that takes place across 12 islands and two ports in Japan’s Seto Inland Sea, features three seasonal sessions (Spring, Summer and Fall), once every three years, though some permanent installations can be experienced at any time. The summer session of the third edition of the festival commences on July 18th this year. The project was launched in 2010 by Kitagawa Fram, inspired by his earlier initiative, the Echigo-Tsumari Art Triennale, which takes place in the rural villages of Niigata Prefecture on the Japan Sea coast. 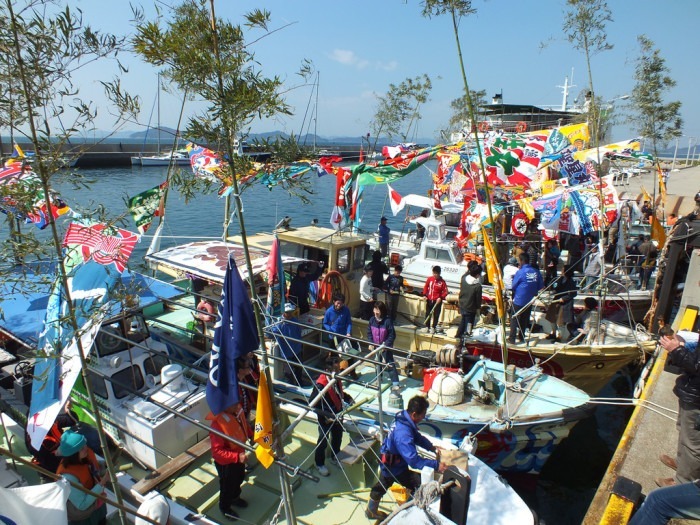 The recurrent theme of the festival is the “Restoration of the Sea,” with the goal of curbing depopulation and revitalising the Seto islands through art. While the Triennale itself is the brainchild of Kitagawa, he is not the first to use these islands as a backdrop for art. The Fukutake Foundation, its benefactor the billionaire CEO of an educational publishing and cram school firm, has been doing this for a little more than 20 years. Starting with its Benesse Art Site project on Naoshima Island, it later came to develop world-class museums on Inujima, and more recently Teshima. Since its inception, Kitagawa and Fukutake Soichiro have been working collaboratively, along with the Prefecture of Kagawa, to manage and direct the festival. 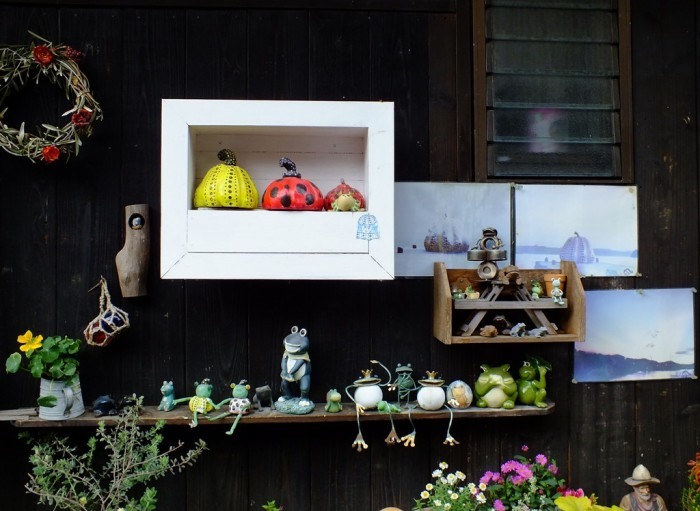 The outside of one house in the village of Honmura on Naoshima island. Because of the multi-partite nature of the Triennale’s organisation, not every art site is managed the same way. The main division is between those managed by and belonging to the Fukutake Foundation, and those managed by the Triennale’s Executive Committee and belonging to various groups and people, mostly the Prefecture of Kagawa but also private individuals or local communities. The Fukutake Foundation manages the sites on Naoshima, Inujima and most of the sites on Teshima, as well as Mecon on Megijima. All of the collections here are permanent and mostly open year-round. These artworks and installations managed by the Fukutake Foundation tend to be bigger budget, and by more prestigious, well-known artists. They also tend to feel somewhat elitist, and maybe even “imported”: that is to say, they are disassociated from the context in which they are exhibited, as though they could be located anywhere else in the world. And, while they are integral to the Setouchi Triennale, a certain number of the sites predate the festival and exist more or less independently from it. The art sites managed by the Triennale’s Executive Committee owe their existence solely to the Setouchi Triennale. These can be found on Ogijima, Megijima, Shodoshima, Oshima, Shamijima, Honjima, Takamijima, Awashima and Ibukijima, as well as a handful on Teshima. Again, some artworks and installations are permanent, others are available only during the festival. Unlike works exhibited under the Fukutake Foundation umbrella, the artworks on these islands tend to be on a smaller scale and budget, and not every artist authoring them is famous, but conversely they tend to be more site-specific. More often than not these works are the culmination of the artists’ perceptions of the local culture and identity of the island where their art is located, and could not exist in the same way anywhere else. The artists taking part in the Triennale range from veteran to unknown local artists. To my knowledge, they are chosen by Fukutake Soichiro or Kitagawa Fram, either by invitation or selected from a certain number of applicants. A call for art projects is made every three years for that purpose. Artworks are sometimes created off-site and then installed shortly before the beginning of the Triennale, but in the case of artists incorporating aspects of the island’s culture or history in their creation, they usually stay on site for several weeks, making their art directly in the area it is due to be showcased. It is not uncommon that they build very tight bonds with the local communities in the process, regularly coming back to the island afterwards, and getting involved in the revitalization process. In some cases, they even move to the island. 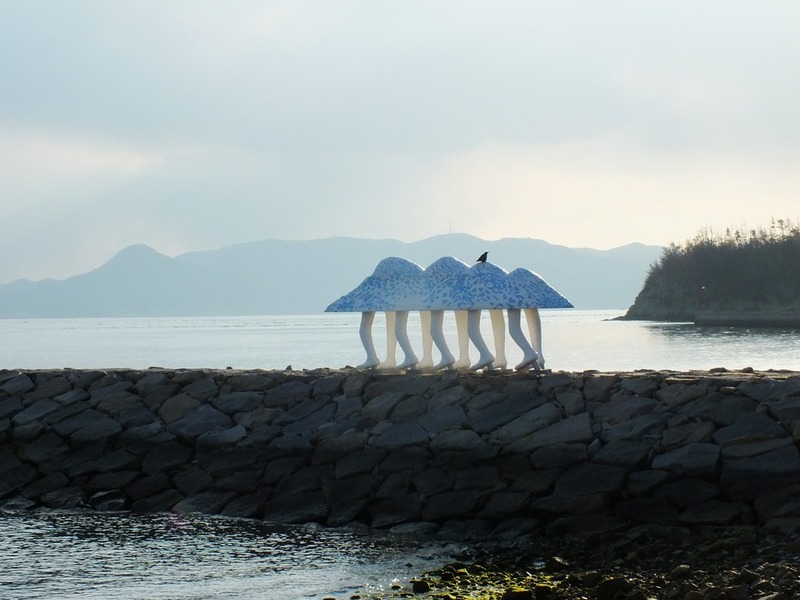 One element that visitors must not lose sight of when they attend the Setouchi Triennale is that the showcasing of art is almost secondary, or rather a “hook” in order to showcase the islands themselves. The goal is to raise awareness about the dire effects that depopulation has had on those insular communities that used to play a very important role in the social and economic fabric of this part of Japan before the modernization of the country, and that have been slowly dying and become forgotten by almost all since. The choice to hold an art festival to achieve such aims may seem odd at first, but the precedent set by Naoshima shows that it can work. Also, throughout Japan, it has become clear now that managing to successfully attract younger populations away from the big cities and back to rural areas cannot really be done through the traditional economic activities historically linked to those areas, namely agriculture or fishing. If Japan wants to save its countryside, it must try to be innovative and attempt measures that seem counter-intuitive. While art is generally perceived as a very urban and even somewhat bourgeois activity, it also can become an engine that ultimately makes a rural area attractive again to a younger population. And while this endeavor will continue into the foreseeable future, what we are seeing is very promising. What is also interesting, and what visitors should also keep in mind when they visit the area, is that each island has its own identity, culture, its own strengths and shortcomings. As a consequence, what may work on one island, may not work on the other one. I would like to take the example of two islands to illustrate this point. As part of Team OGI’s project which took place on the opening day for each of the Triennale sessions in 2013. The boats, full of flags and bells, sailed around the port area in a display traditionally celebrating an exceptional catch. If we take the most famous of the Setouchi islands, Naoshima, we can see that those large scale installations and museums have managed to attract an important number of visitors and they have turned the island into a somewhat trendy tourist destination, slowly gaining global acclaim. As a consequence, a tourism-based economy was developed on the island (mostly lodging, food, bicycle rentals). However, the presence of art on the island has created a strange situation. Because most of the art is located outside of the villages and away from the industrial area — most people are even completely unaware that Naoshima is also an industrial island — visitors do not really get to know the island as a social space. They see the beauty of nature, they are amazed by the art, they go to the cafés and restaurants created for them. But at the end of the day, they have barely encountered or learned about the communities that live on the island. On a personal note, of all of the islands where I regularly go to, I think this is the only island where I have never spoken with a local, and where I do not know anybody. When I am there, in the eyes of locals I’m just another tourist among many others. And that may be the price that Naoshima’s locals had to pay. While their island has become a popular tourist destination, the identity of the island has been greatly affected. 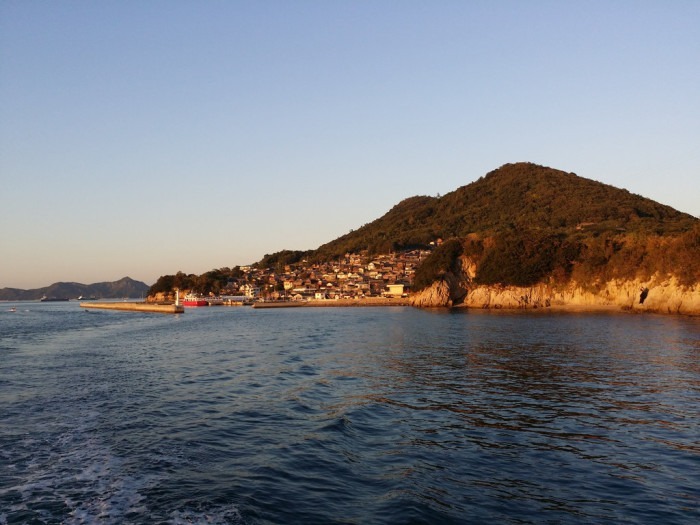 Yes, the island has been revitalized, but the “real” Naoshima may be gone soon anyway, replaced by a different thing that just happens to be located on the same spot. On the other end of the spectrum is Ogijima. For a long time, Ogijima was probably one of the most isolated islands in the area, and it was slowly dying a quiet death, ignored and forgotten by all, except the people who have family there. The first Setouchi International Art Festival (as it was called at the time, and is still called in Japanese) was an electroshock for the island. The locals, with the help of some artists, realized that they were disappearing and with them a very unique community. They also realized that it was not inevitable, and that it did not have to be this way. Finally, they also realized that people who came to the island greatly enjoyed it, and that yes, their island could be attractive to outsiders. It really was a wake-up call, maybe not to all residents, but for enough of them. They decided to make their island more attractive, in various ways. It really started very simply with small events, mostly aimed at the locals, and their friends and family. The island simply became alive again. And little by little more people started to go there regularly, interacting with the locals. The tipping point was when some people realized that they could live there. Some of them were born on the island but moved away as they grew up, some others had only visited a couple of times prior. One thing that mattered to all is that Ogijima shouldn’t become another Naoshima. The art was to be a catalyst, but the goal really is to develop a local community, with local sustainable activities, not just tourism. Today, while nothing is ever “won”, one can say that Ogijima is one of the successes of the Triennale. Every year, new families move to the island. The school has reopened, a few businesses too, there is even a crowdfunded library and, for the first time in decades, the population of the island has grown. Those may be the two most significant examples, but, you may find different and specific stories on every island. The point is that the Festival is working; the islands have been revived. And, art is not necessarily an end in itself. One must keep in mind that it is an ongoing endeavor, and the day when the Triennale won’t be “needed” anymore has not arrived yet. So, what can visitors expect when they come to the Triennale? One surprising thing is that access to the islands and sites is not always convenient. There are two reasons for that. First, there are simply some practical limitations. Sometimes there are not enough ferries running to a particular island, simply because the ferries don’t physically exist and the company managing that route simply cannot afford to get an extra one. Also, the success of the second Triennale in 2010 took everyone by surprise. Six years later, while the organisation is more prepared and has a better idea of what to expect, the fact is that they are still learning and new challenges arise every time. It is a very unique event in many ways, and there are not many precedents, if any, to draw experience from. Another reason is more deliberate. The goal is not, and never will be, to turn the area into a mass tourism destination. The goal is to preserve and revitalize the area, and that starts with respecting its culture and identity. Most of the locals are quite old, and the Triennale can be taxing for them at times. They are simply not used accommodating so many people on their islands, and that can be pretty disruptive. Were the islands to welcome as many tourists as, say Miyajima Island off Hiroshima (famous for its torii gate in the sea), would be quite destructive and be counter-productive in achieving the goal of the festival. Visitors should always keep in mind, when they come to visit, that their occasional inconvenience is actually preserving a certain lifestyle, a culture. And I would actually encourage the visitors to embrace that lifestyle, especially what is called “island time.” Things simply go slower on the islands, and it’s sometimes pointless to rush. One mistake visitors often make is to try to fit as many artworks as possible, and in doing so completely overlooking the islands themselves. My advice to them is to simply slow down: It’s OK if they don’t see all the art! They should also discover the islands, their nature, their villages. They should stop and chat with the locals, most of them love to talk. Visiting the Setouchi Triennale is not only about viewing art, it’s also experiencing a different lifestyle, a slower and more relaxing one than what they’re used to in the city. Visitors really shouldn’t limit themselves to the most famous islands and artworks, especially if they live in Japan. As previously mentioned, all of the art on Naoshima is permanent. It can be seen at anytime, one doesn’t need to wait for the Triennale to see it, there are some much better and less crowded times to see it. Visitors should make room in their schedule for the other less famous locations. There, they can see works and installations they’ll never be able to see otherwise, and more often than not, they’ll be able to see it in very unique and picturesque settings, meeting some of the nicest people they will ever encounter in the process. And in any case, whatever people end up seeing, I am confident they will have an amazing cultural experience, and hopefully also discover a part of Japan that they previously didn’t know existed.